Photo of Mater Matrix Mother and Medium multimedia performance by Rodrigo Valenzuela. 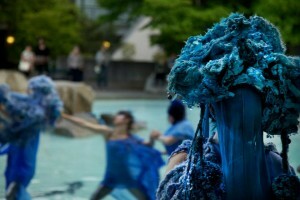 An intricate 250-foot fiber web of brilliant blue and white flows around the Alki Courtyard at Seattle Center, just north of Key Arena—Mater Matrix Mother and Medium, an ever-evolving art installation by Seattle-based multi-disciplinary artist Mandy Greer. The crocheted river twists and winds its way around columns and trees, rising up to 15 feet overhead. This masterpiece also formed the backdrop of “Saltus Chori Aevum,” a multimedia performance presented by the artist on May 5-6, one of many events organized by the Seattle Office of Arts & Cultural Affairs in honor of the 50th anniversary of the 1962 World’s Fair at Seattle Center. As you might guess from the name, The Next Fifty, these festivities look towards Seattle’s future. Greer’s work celebrates “Sustainable Futures Month” with a powerful meditation on one of our most valued and fragile environmental resources: water. In “Saltus Chori Aevum,” Mandy Greer assembled the talents of choreographer Jessica Jobaris, performance artist Saskia Delores, dancer Andrea Ives and harpist/composer Monica Schley, in a presentation of sound, imagery and sinuous movement around—and often in—the DuPen Fountain. Wearing Greer’s own crocheted headdresses and elaborate beaded mantles, the performers floated an ice block in the pool and sent sprays of water flying, evoking the nature of the element itself. Though often playful, this tribute to our local streams and waterways firmly highlights the need for environmental stewardship. A film project by Rodrigo Valenzuela based on the Mater Matrix Mother and Medium performance will premiere in June, and the piece itself remains on display in the Alki Courtyard through May 31. Originally commissioned in 2009 with Seattle Public Utilities 1% for Art Funds, the “fiber river” was crocheted by many hands in community gatherings, then installed at West Seattle’s Camp Long. It has since traveled as far as St. John the Divine in New York City. 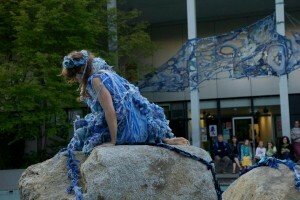 The artist invites the public to add to the ongoing crochet installation during the Northwest Folklife festival on Memorial Day weekend. Other events in May sponsored by the Seattle Office of Arts & Cultural Affairs include Stokley Towles’ Stormwater: Life in the Gutter, a one-man show tracing the path of urban rainfall from sky to gutter, on May 18, 19, 25 and 26; and a screening of Water Calling, five short films by local filmmakers SJ Chiro, Britta Johnson, Susan Robb, Luke Sieczek and Rick Stevenson, at SIFF Cinema on Sunday, May 27. For more information, visit www.seattle.gov/arts. To learn more about The Next Fifty, visit www.seattlecenter.com.